Noordenne Avenue Seaholme not only recognises the contribution to the Altona area by the family but is situated in the middle of the Bayside estate established by Lew and Joan Noordenne. The name Noordenne is as much a part of Altona as the civic hall clock tower. Lodewyk (Lew) Cornelis Noordenne (van Noordenne) (1921 -2013) was born in Geissendam, Holland and married Johanna (Joan) Angenieta Noordenne (1924 – 2010) in the Dutch riverside town of Sliedrecht in 1951. Lou had been prominent on the staff of a building company. Joan was a secretary with accounting skills. When they came to Australia, from their native Holland in 1951, as a honeymooning couple, the young Noordenne’s had enough cash to build two houses. Their first home was in Upton Street in 1953 then financed the building of a second home in Civic Parade for friends who had arrived from Holland. They had built their first two homes -for cash and had enough collateral to borrow money to build more. From then on, the contracts started “rolling in” and Lew put up the second mortgage on nearly every house they built. In his first year, they built four homes, the following year nine and within five years they were building 50 homes a year. For the first 10 years, most of the homes built by Lew were weatherboards, for-two reasons — economy and the climate. The year 1959 was the Noordenne’s boom year, but .for the next three years, they too was to feel the effects of a recession that hit Australia. By 1963, however things were back to normal and Lew built record number of 73 houses. They has topped this figure only twice since, with 80 buildings in 1966 and 85 (including flat units) in 1968. The bulk of his houses are in the two estates they has built, and in Altona West. The two estates are the Noordenne estate at the rear of their own double-storey home in Millers Road, and the Bayside Village, north of the Altona Soccer Club ground on Kim Reserve. Lew was the first local builder to take the gamble and build a house in the swampy area known as Altona West. They built the first house in Dove Avenue and had to fight together with the person they was building the property for to persuade the Board of Works and the SEC to supply water and power for the property. The couple branched into shopping centres. The scale of their operations increased when they took over the partly-built centre at Taylors Lakes, near Keilor, from the failed West Australian tycoon, Alan Bond. Another shopping-centre site became available at a flat barren spot enticingly to be called Altona Meadows. In 1974 the Noordenne’s began to slow down not building so many homes now because of the shortage of building materials and high costs involved. Instead, the Noordennes devoted more time to the three dairy farms they own in Leongatha. The farms total about 1200 acres and carry 850 milking cows. The Noordennes have five children, Corrie, Anita, Louise, Brian and Martin. Martin, the youngest, is the only one to have a street named after him—Martin Court, on the Bayside Village. The Noordennes have lived in three houses since settling in Altona. After residing at 37 Upton Street for three years, they moved, to the corner, of, Upton and Blyth streets for seven years and eventually to a home in Millers Road. Apart from his work in the building trade, Lew has been a keen backer of the Altona Soccer Club. He was president for a period he financed and built the modern clubrooms on Kim Reserve. Joan Noordenne died in Melbourne, aged 85, leaving as a legacy her part in constructing more than 1000 homes, numerous shopping centres and an Altona estate dissected by a street in her family’s name 12 January 2010. Lew passed away peacefully 8 October 2013 aged 92. Martin Court is only only other Street in Altona, and surrounding suburbs, specifically named after one of the Noordenne family members. The honour was given to the youngest of the five children or Lew and Joan Noordenne, Martin. Martin became involved within his parents business and it became a family affair with his brother also taking an activity part. With the passing of both his parents, Martin inherited the family home in Millars Road that held so many great family memories and with about 15 other relatives has ensured that the Noordenne name remains a force within the Altona community. To read more about the Noordenne family and their contribution to Altona refer to Noordenne Avenue. Named to acknowledge the long and honoured connection of the Twentyman family with the district of Altona. George Thomas Twentyman, Honora Twentyman and their family moved into Altona circa 1925 residing in Pier Street. They became involved in all manners of local activities and the affairs of the small hamlet of Altona. George felt passionate enough to contest the 1928 election to represent the Altona Riding on the Werribee Council, losing narrowly to Charles Cherry, David Grieve and John O’Brien. Unfortunately George passed away in June 1934 leaving Honora to care for their children. Just after George’s passing the family negotiated to rent and reside in the Altona Homestead where they lived for about 12 years, before council requested its use for other purposes. The family were keen sports enthusiasts involving themselves in the local cricket and tennis clubs. In fact Honora was made a life member of the Altona Tennis Club for her valued contribution. It is not just in the sporting arena that the family contributed to life in Altona, Honora was also a strong member of the church and the Elderly Citizens Club until her passing in September 1965 at the age of 83. The Twetyman family continue to reside and participate within the Altona community to this day and the naming of Twentyman Court is a testimony to their contribution to our community. Waters Drive recognises the contribution James William Waters provided to the community of Altona and the Shire & City of Altona Council. Following Altona succession from Werribee, James Waters was appointed the inaugural Shire Secretary and then the Town Clerk when Altona was declared a City. His involvement within Council and within the community spanned 15 years when Altona was in the process of standing on its own. James Waters came to the role with strong credentials and a valuable background within rural communities which was to give him a broad base of knowledge to deal with the issues facing Altona, at that time. Jointly with Councillors and the new Engineer, Ralph Simmons, they set about converting the mud tracks to made roads, repairing the endless potholes within the existing made roads, developed the foreshore, improved drainage and create parks and reserves. In early 1968, James Waters supported the then move of Council, under J J Ginifer, to outline the benefits versus cost of becoming a City which came to fruition in December of that year. James Waters is recognised for this contribution to our community. Kasimir and Sophie Jurga were Polish immigrants that arrived in Australia in 1949 and purchased a block of land in Altona in 1953 and set about building their own home from plans that they purchased for £5. By 1955, with two rooms lined and floored they moved in. Kasimir then organised all of his neighbours along the intended route for the water mains and together they dug the required ditch for pipes that allowed the connection of water to homes a lot sooner. Kasimir was a theatrical and commercial artist in Poland and he used these skills when he came to Australia.He soon became the point of contact or the go-to person for migrants who needed information on who to get things done or where to go for information. He was elected to the Shire of Altona council in August 1964 and served for 3 years. He declined to stand again, even though he was encouraged to do so. He was recruited by Arthur Calwell to join the Australian Labour Party and was endorsed by the Altona Branch to run for election. Whilst he did run he did not conduct a campaign, advising “If the people want me they will vote for me”. Kasimir quickly settled into Australian life and the community of Altona but never forgot his roots and how difficulty it was for new migrants in a new country. He was a friend and advocate for all and provided that link that helped new migrants settle into the Altona community. It is fitting that his contribution is recognised in the naming of this street after him. 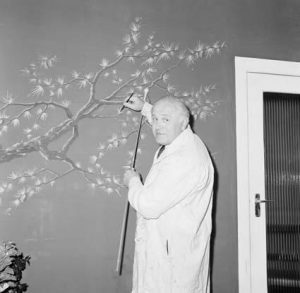 Photo: Kasimir painting a mural on his living room wall in the house he built for his family. Simmons Drive was named to acknowledge Ralph Carnegie Simmons’ contribution to Altona and his 20 years municipal service from 1958 until December 1977. Ralph, similar to James Waters, was the inaugural Engineer for the Shire and then City of Altona. Together with James Waters he worked to bring the roads, footpaths, drains, and other infrastructure up to date that was fitting for the new municipality and the needs of the people of Altona. With such a strong connection with James Waters during the time the worked together within the Shire and then the City if is ironic that Waters Drive and Simmons Drive meet as one at Noordenne Avenue, as these two men oversaw an immense amount of improvements and development across Altona, and would have had a constant and good working relationship with builders and developers such as the Noordenne family. The facilities that were established at that time, that were overseen and instigated by Ralph and James are still being utilised by our community today.